Being able to see your surroundings is useful when cycling. 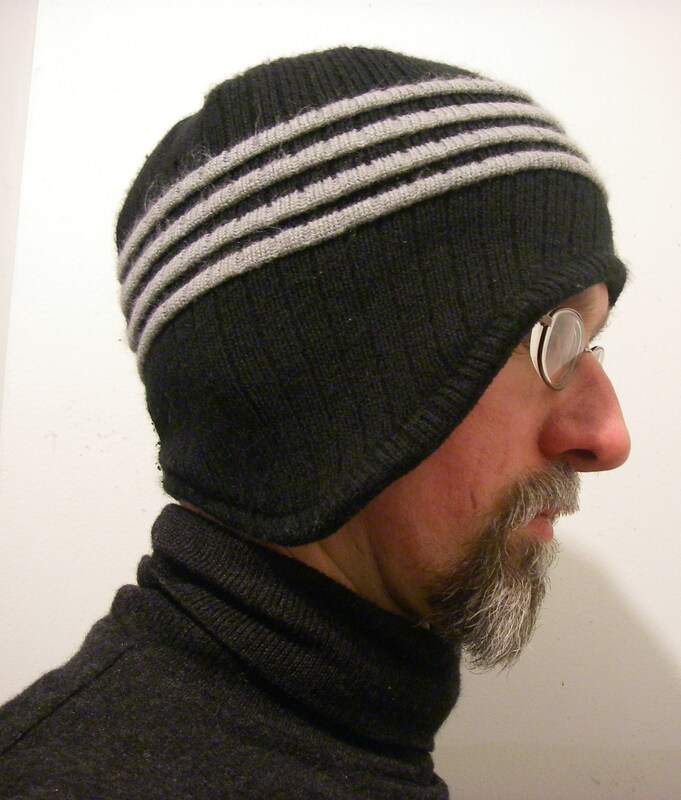 Unfortunately, as any cold weather, glasses-wearing cyclist knows, it is is not always easy. When the temperatures are low enough to require you to cover your face, your scarf, balaclava, etc. directs your moisture laden exhalations up to condense on your glasses, fogging them. Instant white-out! In extremely cold weather (-20C for instance) it is almost impossible to avoid. Last winter, I tried a variety of solutions with varying effects. 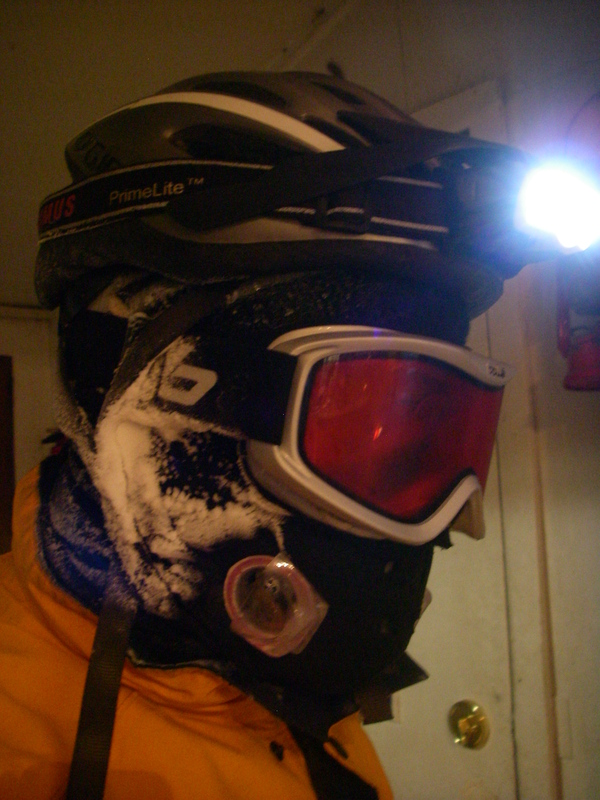 On the very coldest of days I resorted to finishing my commuting ride without my glasses. This was not ideal. However, this year I have finally solved the problem. 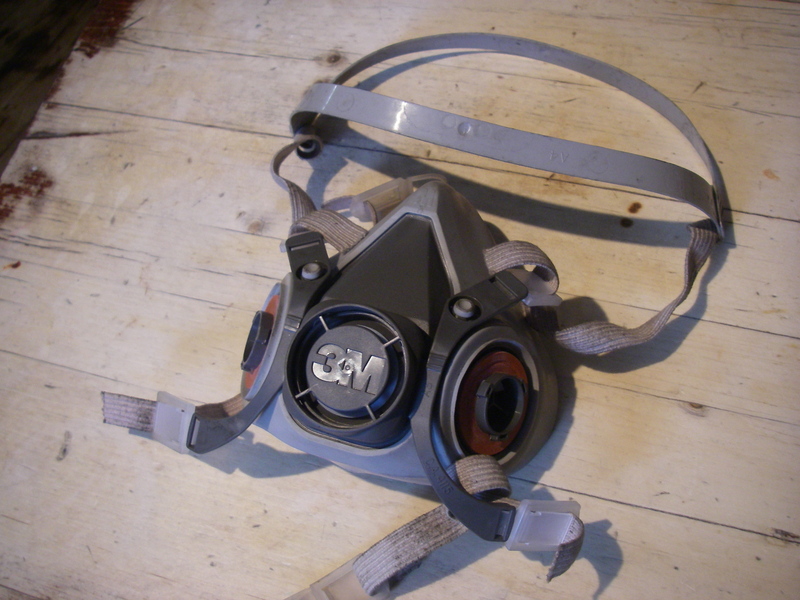 3M 6000 Half mask respirator. Filters not shown. The basic idea is to direct your breath somewhere other than upwards. To do this I am using a half-mask respirator with detachable filters. This is a commonly available bit of safety equipment available at any hardware store. The one I am using is a 3M 6000 series mask. I’m using this model because it’s the one that I already had in the house. It is cheap, with online prices ranging from $6.00 to $16.00. The respirator is designed to snugly hug your face and direct your breath solely through the filter openings. 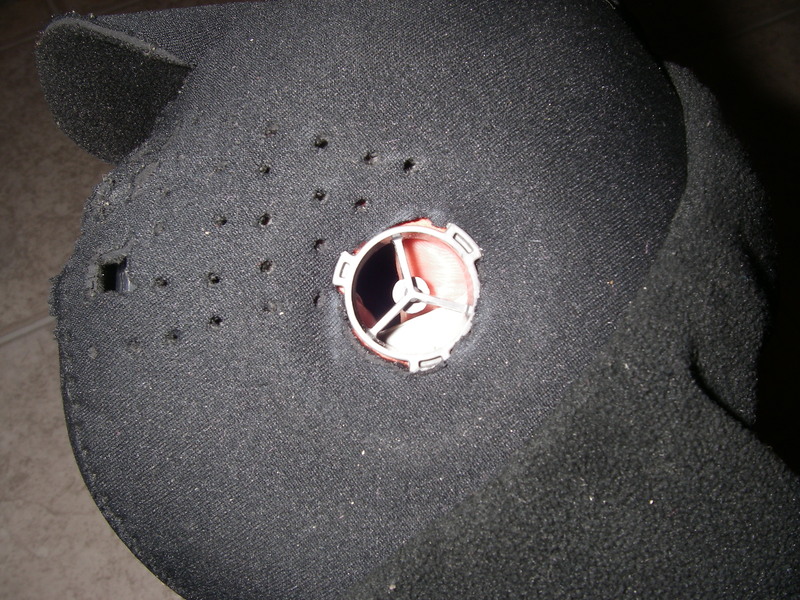 The 3M 6000 has the air intakes on the sides of the mask and the outlet on the front. For our purposes, we want to modify this, making the side openings the outlet, so as to direct your breath away from your glasses. There are cold-weather respirators that are already designed to do this, and would likely work perfectly without modifications. I haven’t tried them. 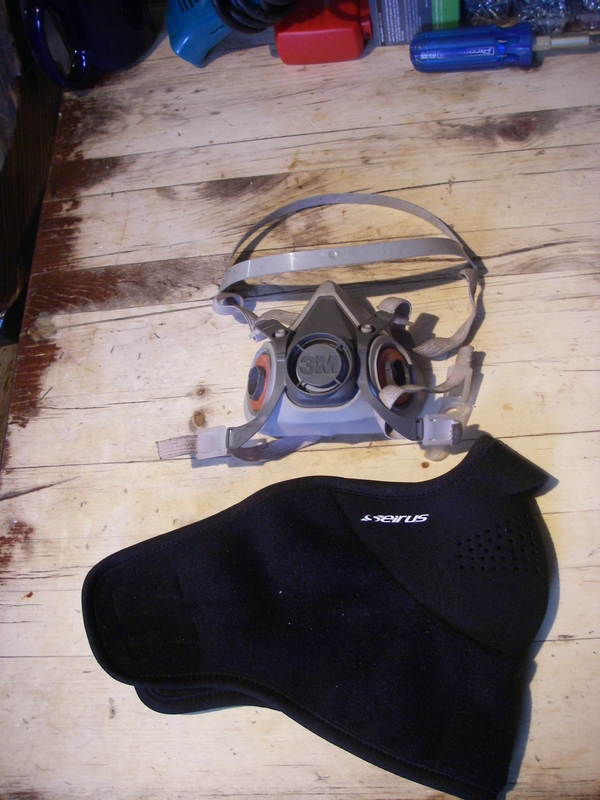 The changes I have made to my mask are reversible, so after the winter I’ll still be able to use it as a respirator. You will also want to be able to cover the rest of your face. In my case, I have cycled in temperatures as low as-32C, and have a strong motivation to cover every exposed inch of skin. 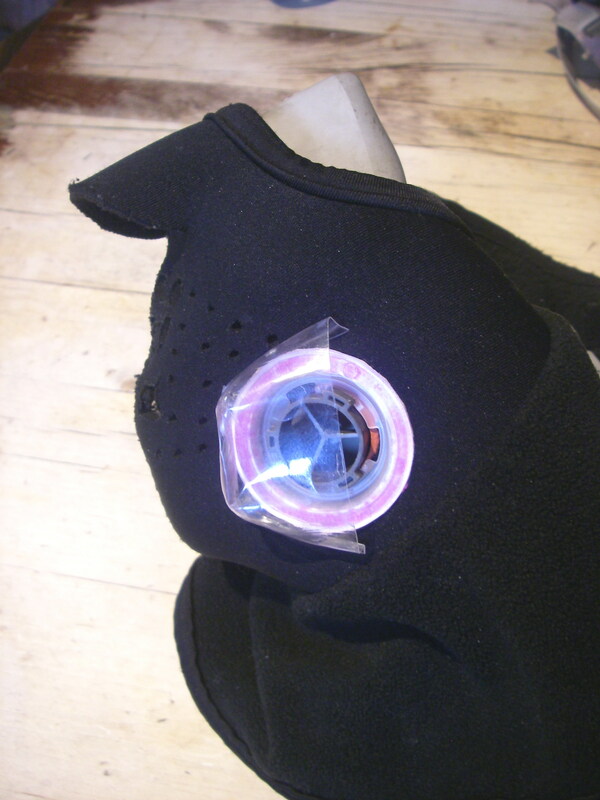 For a face covering I am using a neoprene/fleece mask. It is thin, insulating and stretchy. I bought mine last year at Army & Navy for $10.00. MEC has a slightly better version for $32.00. 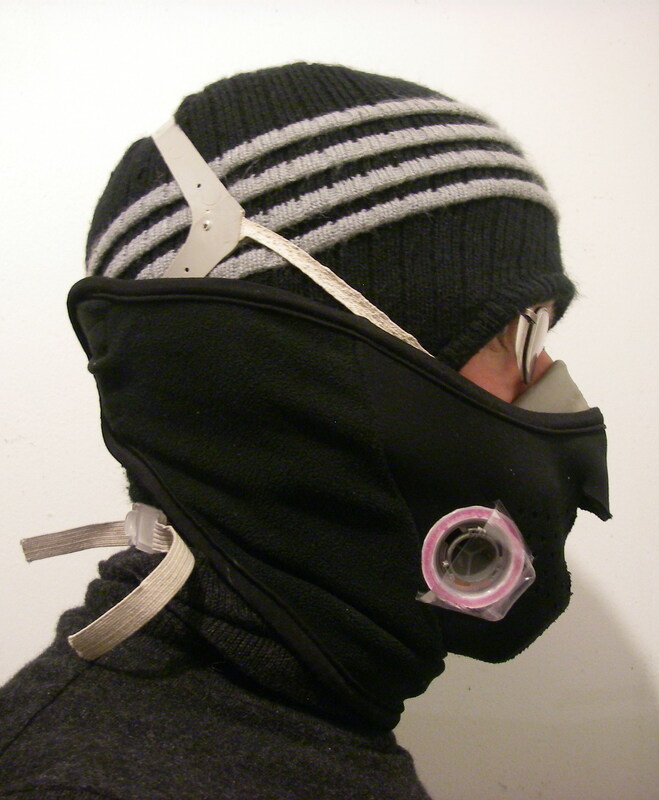 For the purposes of this project, you could likely use whatever face covering you already have (scarf, balaclava, etc.). 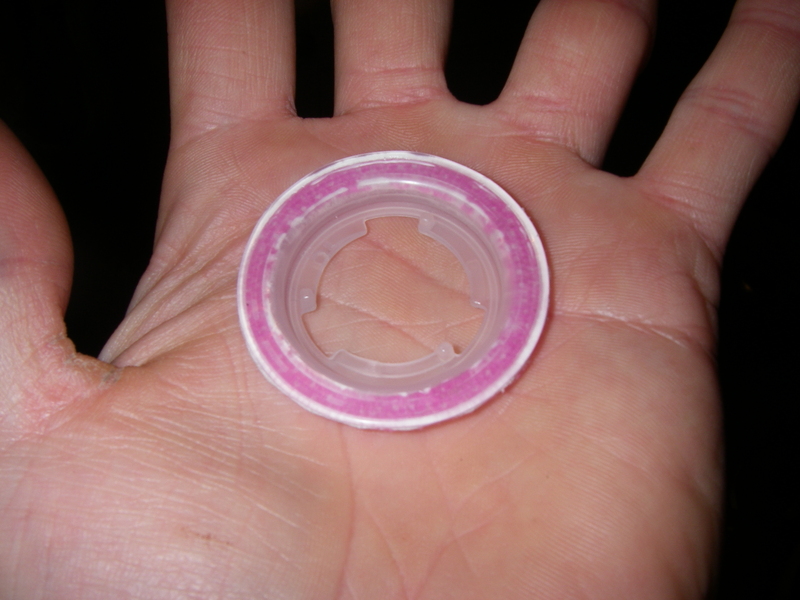 There are little elastomer disks that normally prevent air from exiting the side holes. Remove these. If you are carefull and don't damage them they may be reinstalled if you want to use the mask as a respirator again. It looks like this afterwards. Air is now free to flow in both directions through the side holes. The air normally exits from the front. Block this. I am using a scrap of bubble wrap and packing tape. It's ugly, but it works, and in any case it won't be visible when you are finished. 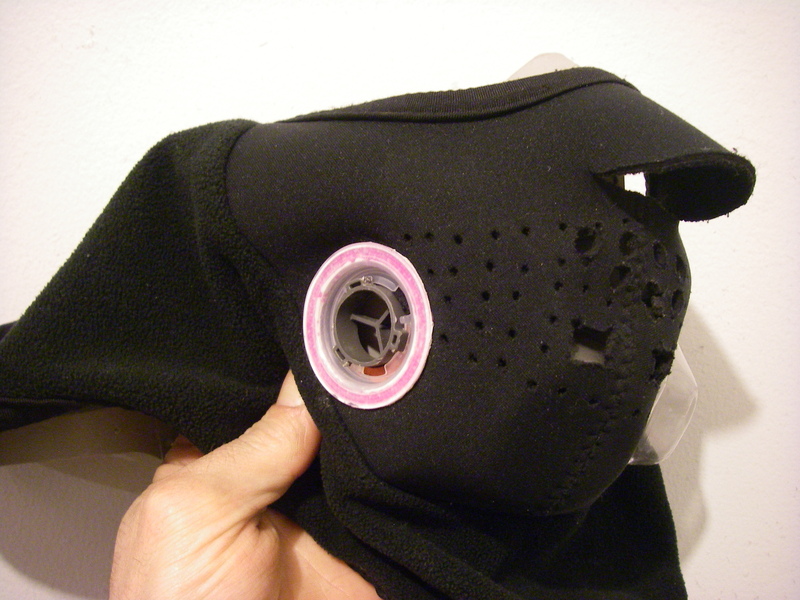 Next, cut two appropriately placed holes in your face covering and fit it over the respirator, with the side hole exposed. The filter looks like this. 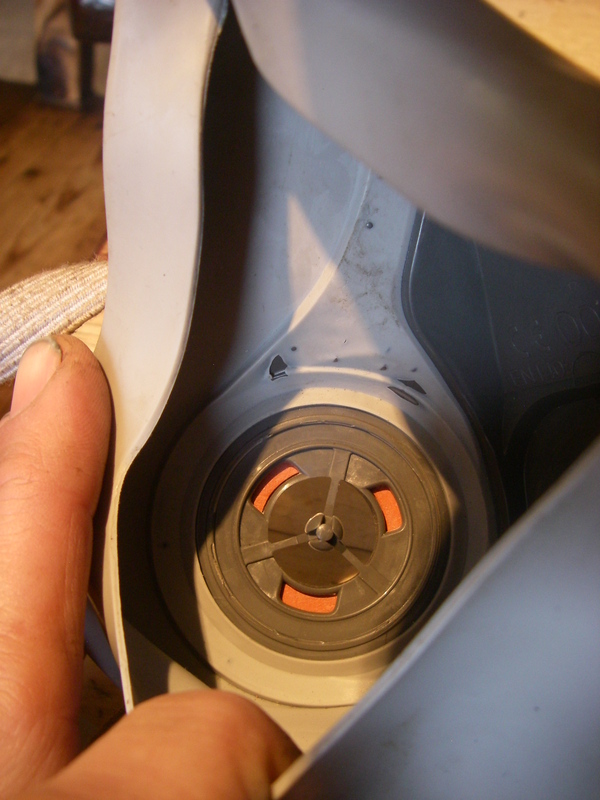 Cut the filter pad from the plastic locking clip. 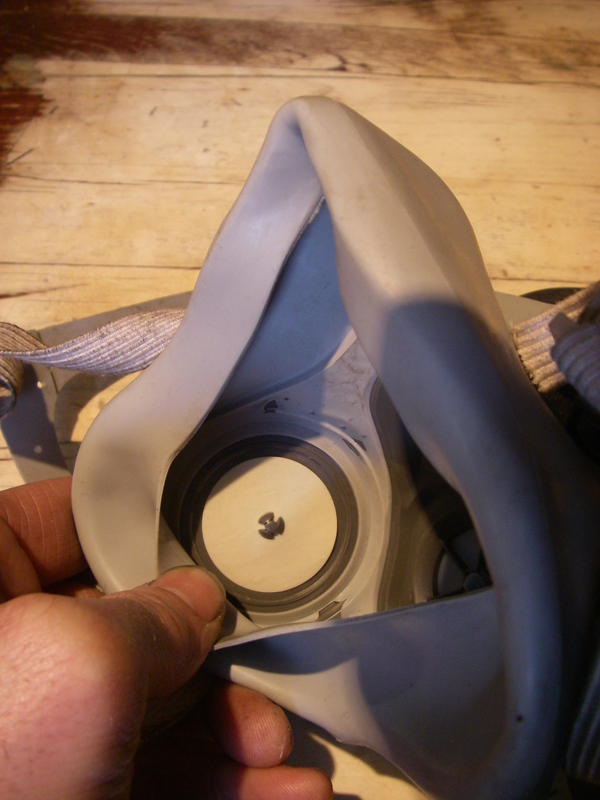 Twist the locking tab onto the respirator. 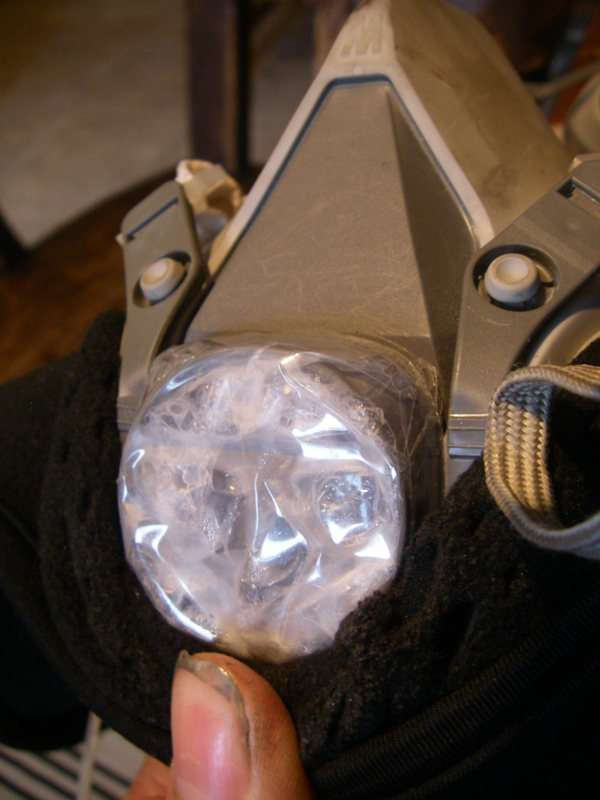 This will securely attach the face covering to the respirator. It may be a tight squeeze, depending on the thickness of the face covering you are using. At this point you are pretty much finished. The mask / respirator combo may be used with good results as is. I have tested it at -20C in this state and it worked fine. However, at lower temperatures I found that too much cold air blew in directly though the side holes. 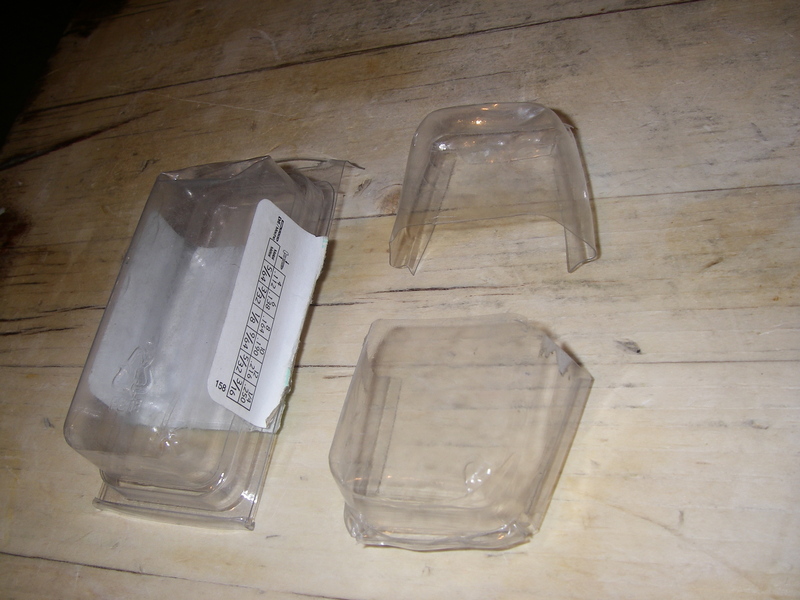 To prevent this I made a couple of baffles out of some plastic packaging. This was intended to be a temporary measure until I found a better solution, but it has worked so well that I haven’t bothered to replace them. I cut these from a small package that contained bolts. I then just hooked them under the locking tab. They quite effectively direct the exhalations backwards while preventing too much in-rushing cold air. 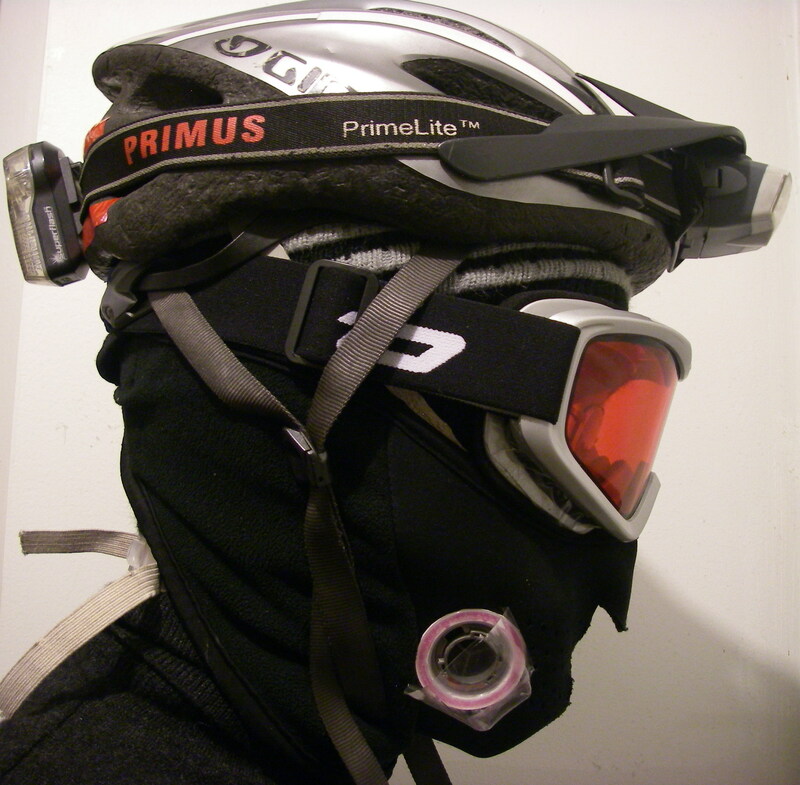 In this configuration I have used the mask on a 45 minute ride when the temperature was -32C with a windchill of -44C. I was perfectly comfortable and enjoyed fog free vision. 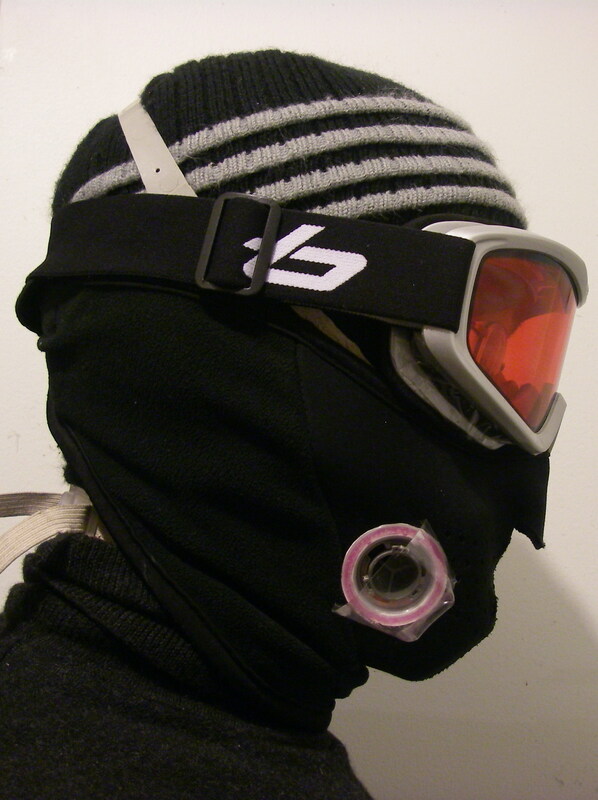 On those extremely cold days, I wear cheap ski goggles that are allegedly anti-fogging. Last year, they still fogged up somewhat. With this mask there was no fogging. It is possible that at these temperatures your glasses will fog INSIDE the goggles while the goggles themselves remain clear. This is not due to your exhalations and the mask/respirator will not help. What does work is applying a drop of dishwashing liquid on both sides of your glasses lenses. Lightly buff the lenses until they are clear. 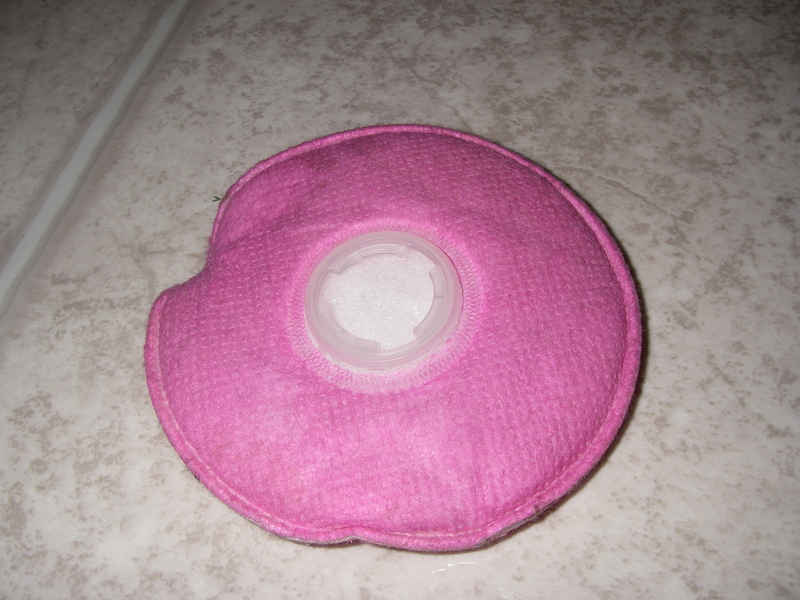 A thin, invisible film of soap will remain that will prevent fogging. Finally, the following photos show the arrangement of coverings I use to ensure total skin coverage. After a month of freakishly warm weather, Winter has returned and it is determined to make up for lost time. The report above shows the conditions for my ride home from work this evening. On Monday, last week, the daytime high was +10C. We all knew it couldn’t last. I have already had the dubious pleasure of setting a new personal record for low temperature cycling. 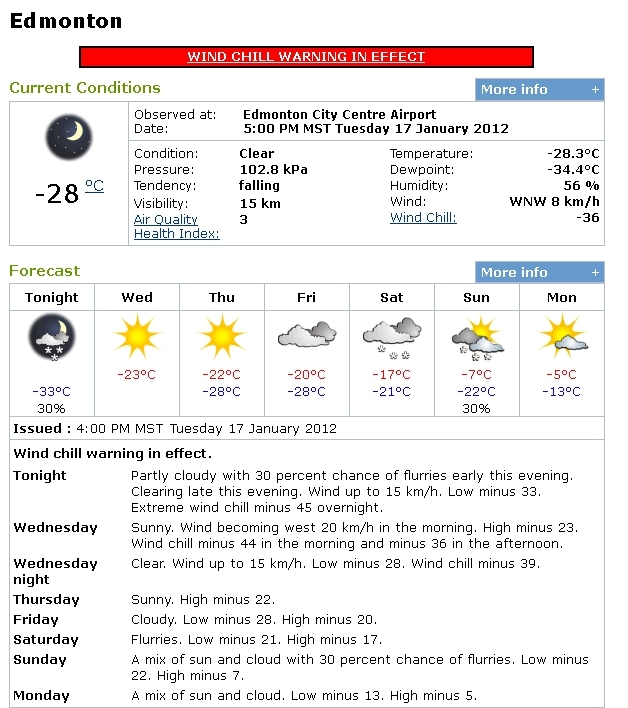 My previous record was -29C on March 1st of 2011. This morning on the way to work it was -30C with the windchill making it -36C. If I cycle tomorrow morning I will likely break that record again. Wheee! This is actually not as bad as it sounds. 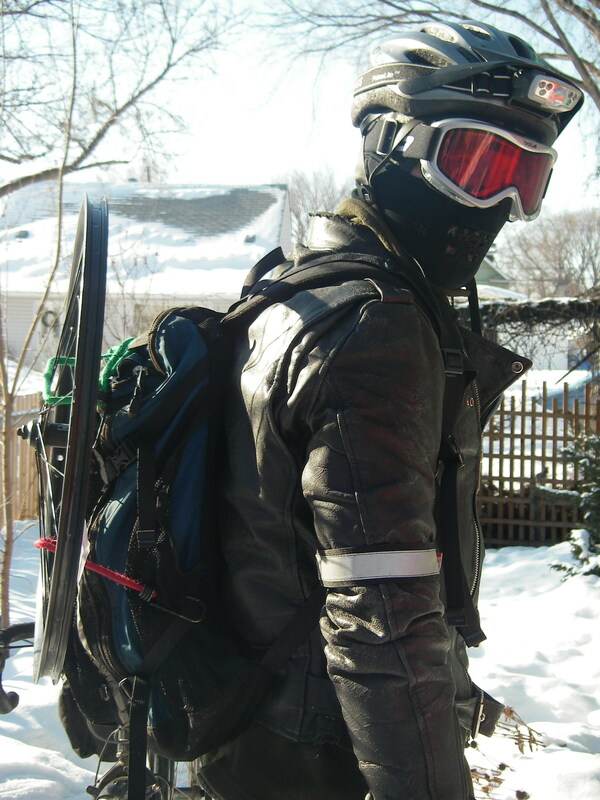 With proper preparation cycling in the deep cold not as difficult as it may seem. Despite the temperatures, I have been toasty warm during my riding the past two days. My experiences last winter taught me what clothing is appropriate under these conditions and I having been paying keen attention to weather report. I am also pleased to report that I have solved the problems with my glasses fogging. This is largely due to the DIY cold weather cycling respirator that I finished cobbling together this weekend. There will be more about this in my next blog post. If I have one real complaint about low temperature riding it is the length of time that it takes to get dressed for a trip. My bike has been acquitting itself well so far. There has been no repeat of the frozen freehub problems I experienced last year. I believe this is because of the oil I lubricated it with in preparation for winter. The rear derailleur has been a bit sluggish shifting down onto smaller cogs but has continued to function. The front derailleur is a cheap unbranded mystery component that came with the bike and it has always worked flawlessly. I am not alone on the trails and roads. 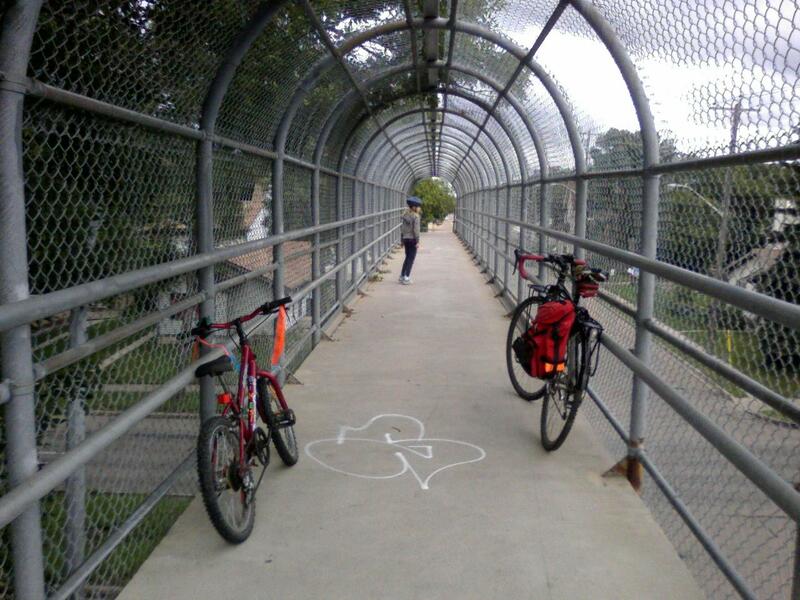 On each each trip I have spotted other cyclists. What was once unthinkable is becoming more common. I ask you, is it really any more crazy than strapping pair of sticks your feet and racing down a mountain? Last October I paid a visit to Value Village to shop for articles of clothing for the Edmonton Tweed Ride. While there I spotted a lone bike for sale. I’ve heard of people finding nice bikes at thrift stores but my experience has always been rather the opposite. 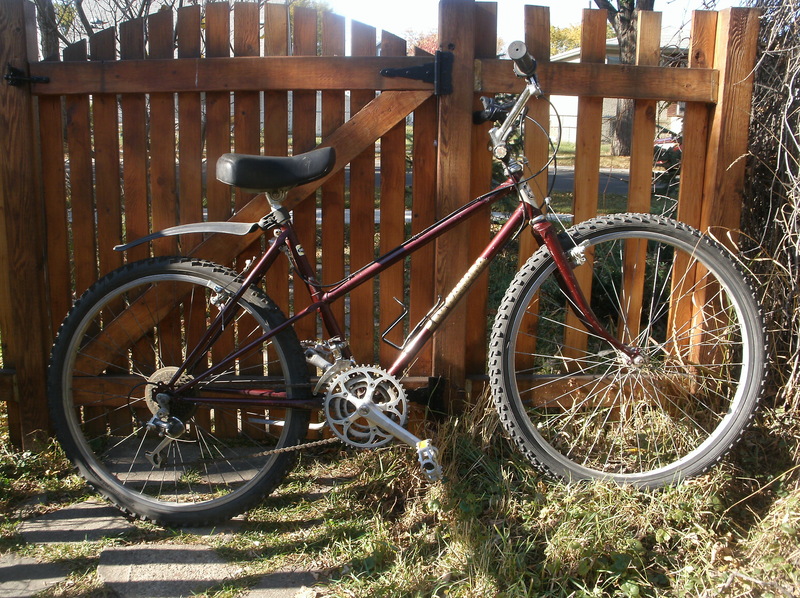 This one, however, was a keeper: an ’85 Kuwahara-Apollo woman’s mountain bike. Lugged Chromoly frame, Takagi crankset, Alloy rims, Suntour Alpinetech front derailleur. It was a sort of semi-mixte with the frame having the extra tubes in the rear triangle but without extending into a top tube. The paint was identical to my ’85 Apollo road bike. It had a few cosmetic problems. Someone had replaced the shifters with cheap indexed ones placed in strange locations and it had the most ridiculously big, ugly seat that I have ever seen. Nonetheless, it was in basically good condition. And the price was only $30.00! Despite the fact that the frame was too small for me and I knew my wife would not be interested in it, I took it home anyway. I was sure I’d find the right person for it. The bike sat in my garage untouched for couple of months until a friend mentioned that she was thinking about trying winter cycling. Her current bike isn’t really suitable so I offered tune this one up and give it to her. It’s taken me a while to finish this project as the extremely mild winter and bare pavement has kept me from attaining a true winter cycling mindset. Last week, with the forecast threatening a return of more normal seasonal conditions, I buckled down to work. For the most part it was in good shape. I noticed that the rear brake cable housing was worn and decided to replace it. A closer look revealed someone had mistakenly used shifter cable housing for the brakes. This isn’t good, as shifter housing is weaker than brake housing and is only held together by the plastic shell. This isn’t safe. Earlier this summer, the aging, brittle plastic of the shifter housing on my police auction bike shattered while I was riding. That would be a bad thing to happen to your brakes. Remembering that incident, I decided to replace all the cable housing on the bike. I should probably do this on all old bikes I work on. 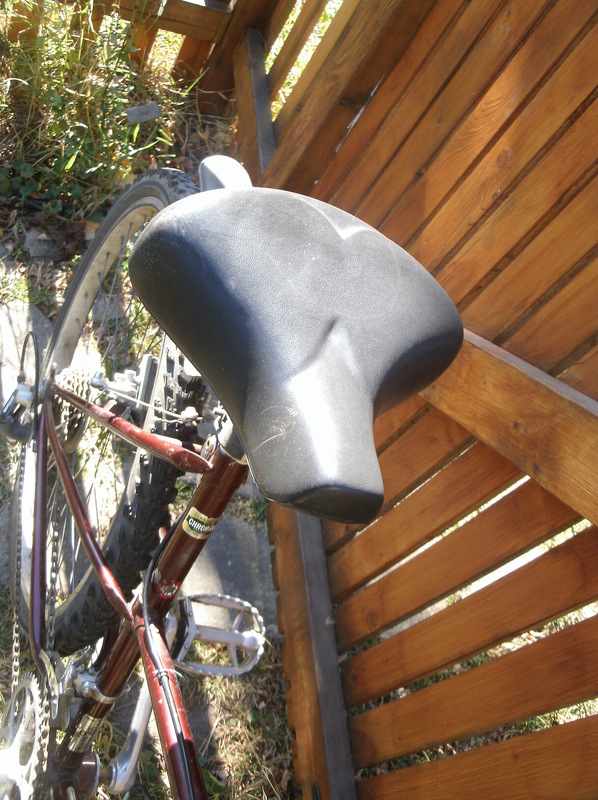 As it it turned out, they had also used brake housing for the shifters. 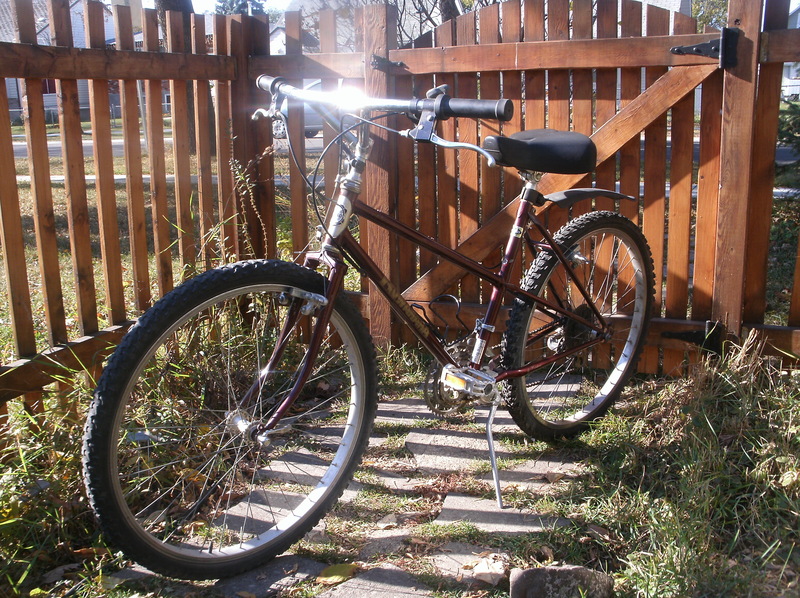 As this bike is intended for winter use, I replaced the the indexed shifter with friction thumb shifters. Last winter I found it it to be impossible to keep the indexing properly adjusted and made the same change on my own bike. 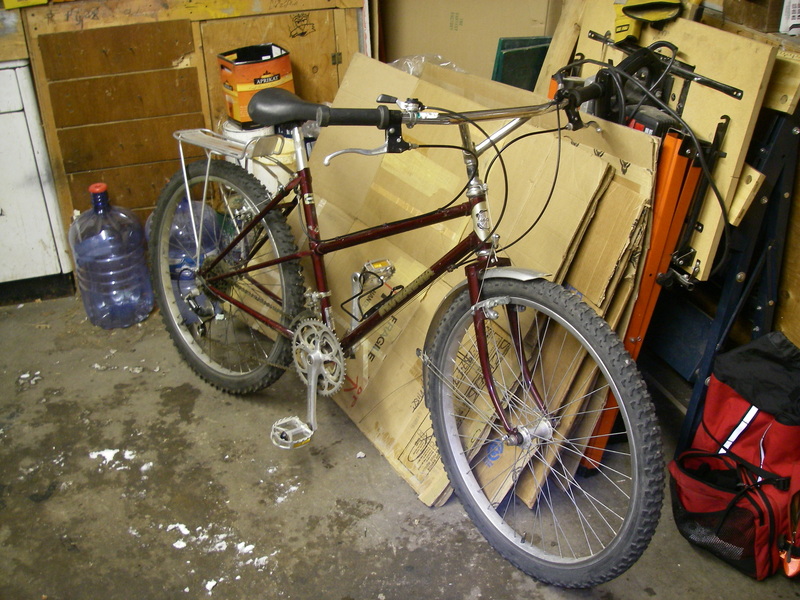 The seat was replaced with a smaller one from my parts bin and I added a decent old Blackburn rear rack. Fenders are rather handy to have for winter riding so I started installing a set I had taken off another bike. The front fender is OK, but I’m not sure there is clearance with the back one to run studded tires. I left it off until I get a chance to stud the tires and check that out. I oiled up all the appropriate bits and was ready to test it out for winter riding. The weather co-operated by depositing several inches of snow Saturday. Perfect. The small frame made it feel like riding a BMX bike, but otherwise all was good. The bike handled beautifully. I ripped through the untracked snow enjoying the floating feeling you get when the tires aren’t quite sinking through to make firm contact with the pavement. I sped trough the empty residential streets and into a local park. Here, the snow concealed hardened ruts of ice. The Kuwahara handled it all adroitly. It really is a lovely bike and I now wish it was my size. In any case, it’s going to a good home. Late as usual, my year-end review. 2011 was a big year for me as a cyclist. Cycling through all the months of the year I was able to pedal 5800km in 313 days of riding. This is up from 4450km in 212 days in 2010. 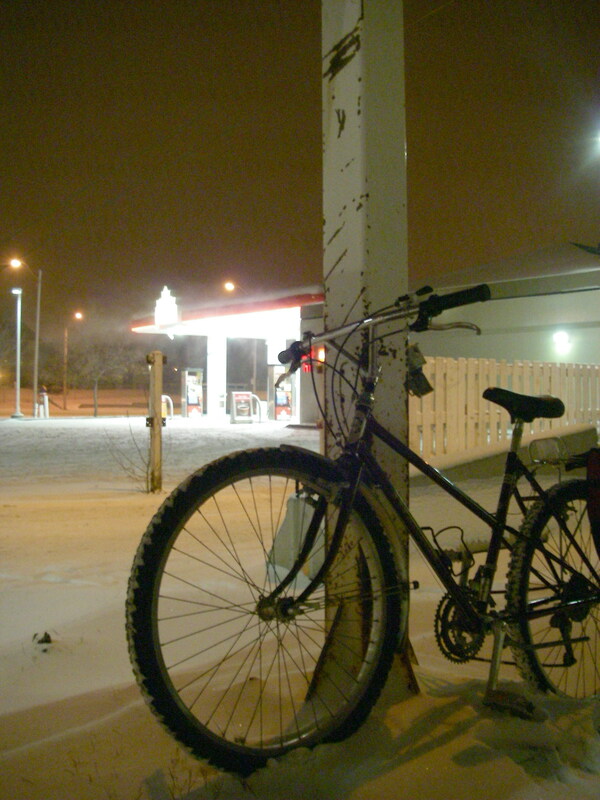 2011 was my first year of riding through the winter. And what a winter! In my decade of living in Edmonton I have never seen so much snow. Heavy snowfalls alternated with unseasonable thaws, resulting in endless sheets of ice. Of course, we also had our customary days with temperatures plunging to -30C . 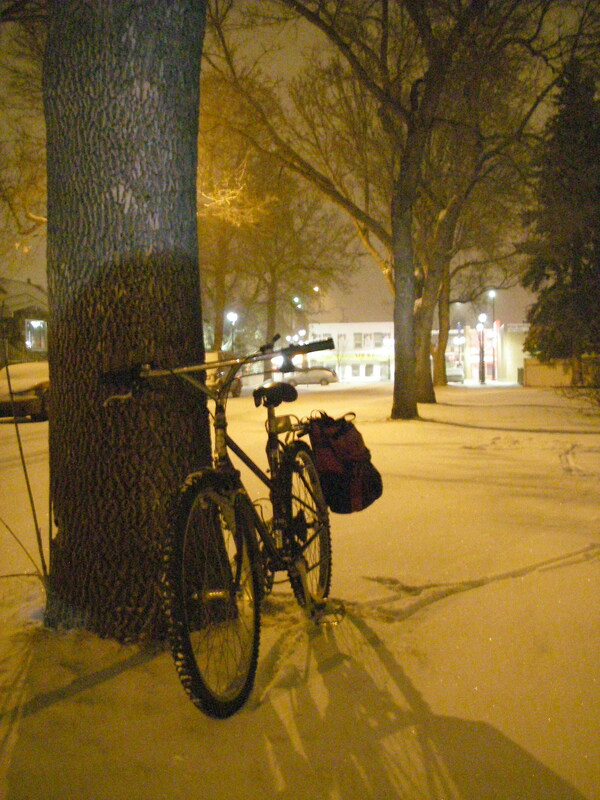 I skipped three days of bike commuting because of heavy snowfalls, but none due to frigid temperatures. It was quite the learning experience for me and I enjoyed the challenge. 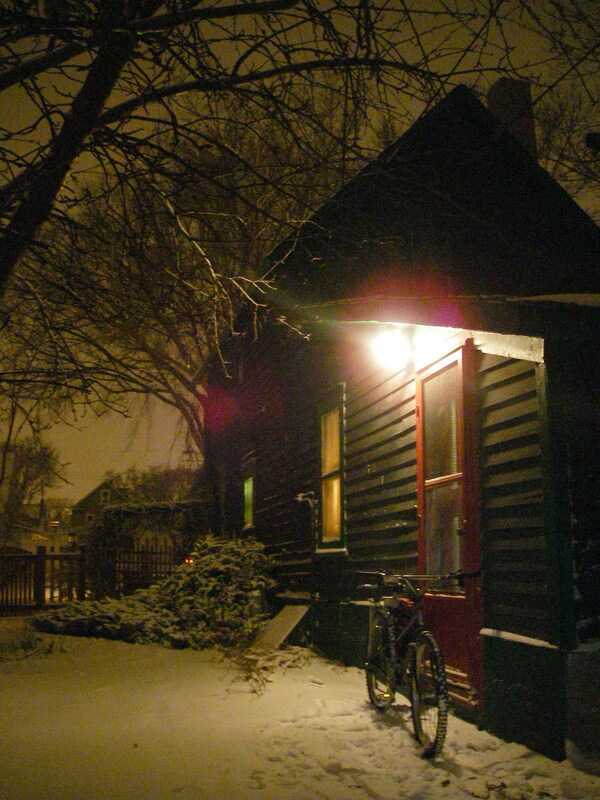 I commemorated this first winter of cycling by penning “The Ballad of the Winter Cyclist“. 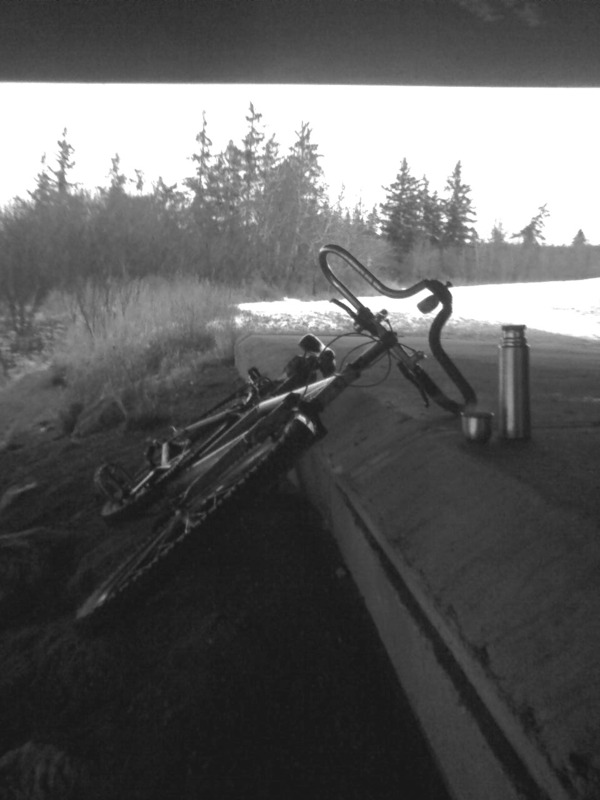 In 2011 I joined the Edmonton Bicycle Commuter’s Society, volunteering as a mechanic and general helper through the summer months. My normal circle of friends aren’t much interested in bikes, so I enjoyed the opportunity to meet other bike enthusiasts. Volunteering required me to talk to lots of people I didn’t know, not something I have ever been great at, and that was probably good for me. I went to the fabulous EBC Bike Art Auction and while I didn’t win any of my bids, I did help to power the music by pedaling one of the bicycle powered generators. The artists in residence used a lot of my pictures in a photo installation, which was pretty cool. 2011 was a good year for pulling wrenches. 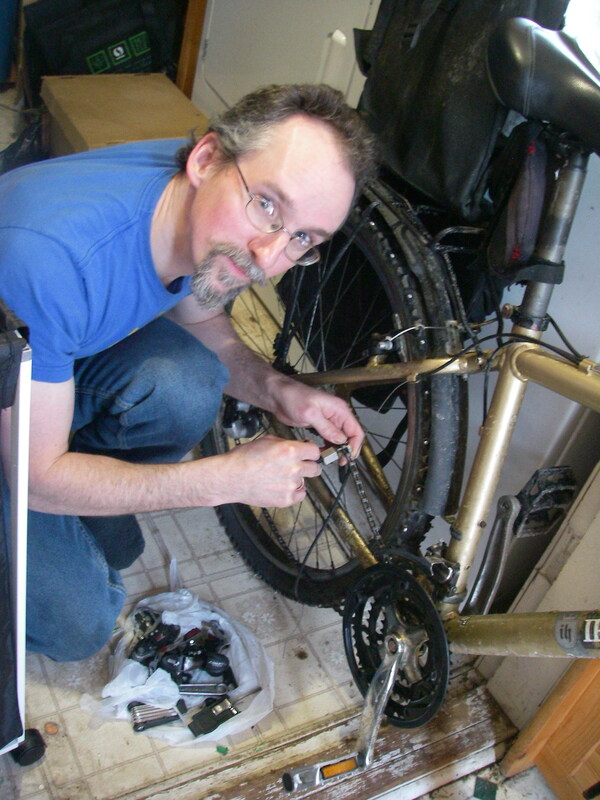 I extended my mechanical knowledge and tackled a number of bike rehabilitation projects. I also fabricated a few tools, most significantly my DIY Dishing Tool and DIY Wheel Truing Stand. These allowed me to complete my first ever wheel build. My ’08 Kona Jake was pleased to receive the newly laced rear wheel and I was happy to not pay someone to make a wheel for me. This process has also made me feel much more confident in my wheel truing skills. I also completed converting two kid-hauling trailers into cargo trailers. 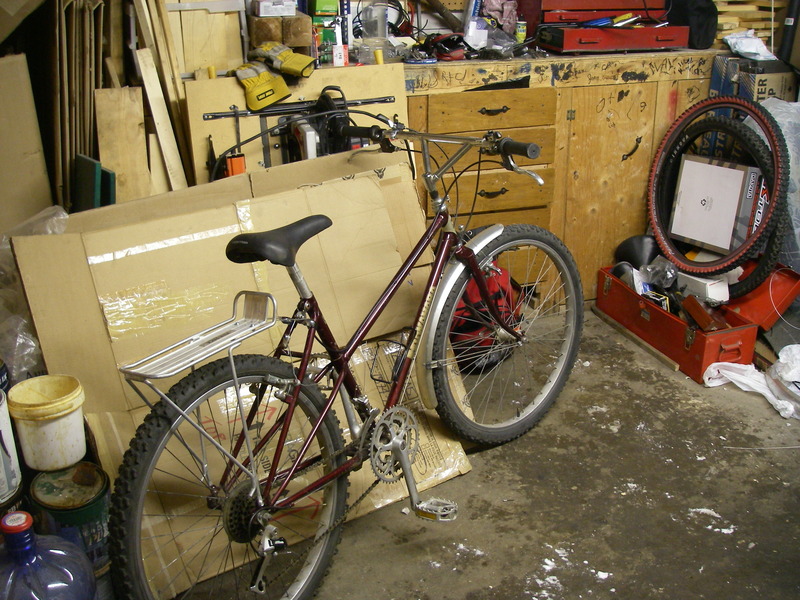 In 2011 the household bike fleet grew by leaps and bounds. Notable acquisitions included the MEC Dahon Origami folding bike and the Apollo Super Sport. Including children’s bikes, the total now stands at 14! How the heck did that happen? In addition to my normal commuting I managed to do more recreational riding this year which was great. Aside from the Tweed ride and my 100km ride, my favourites were the large number of rides I did with my 9 year old daughter. She only learned to ride her bike this year (shame on me, bad cycling Dad) and she’s been doing fantastic. My 3 year old son accompanied me on a 2km walk pedaling his tricycle all the way! That was pretty amazing, too. Finally, 2011 was the year I stared this blog! This was no doubt a relief to my friends and family as it gave me a place to share my bike obsession, preventing my boring them to death. My heartfelt thanks to all those who read Tuckamoredew for your encouraging comments.